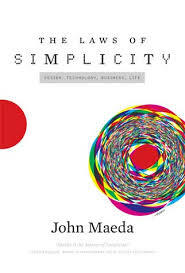 Maeda very clearly lays out 10 Laws of Simplicity and 3 keys to be mindful of in any walk of life whenever you are trying to simplify. 4. Learn – knowledge makes everything simpler. Put yourself in a first time learners shoes if trying to teach. Repetition is key and related to simplicity. Help people avoid desperation. Relate, translate and surprise the user. 5. Simplicity and complexity need each other – do not know fat if have only seen skinny. 9. Some things can never be made simple – and some things you do not want simplicity in (relationships, certain art…). This entry was posted in Books and tagged John Maeda on December 9, 2014 by Blas.